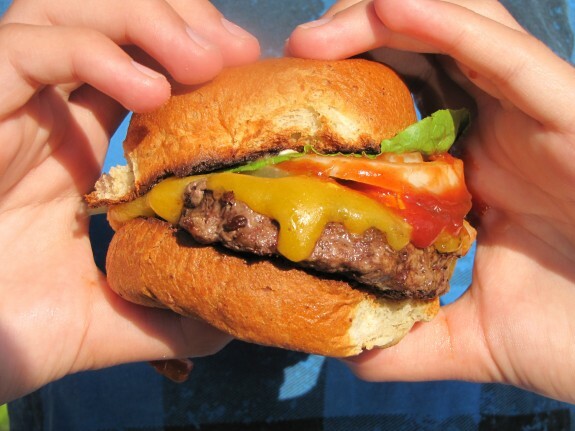 With Udi’s hamburger buns, I am able to give my kids a mouth-watering hamburger that they love! The buns freeze well, but I use them within a few days of purchasing. Go wild with toppings, or stay with the basics with this burger the whole family can enjoy. Fry patties on the stovetop in a heavy bottomed pan (I use cast iron), for about 4-5 minutes. Flip and add cheese and fry 4-5 more minutes. Halve the buns and with a spoon or your fingers, scoop out the center of the top part of the bun and discard. This makes the bun much lighter. Butter each side and set under a hot broiler for 2-3 minutes or until nicely browned. Add your patty and favorite condiments and go to town! Serve with Onion Rings if you want to splurge, and Broccoli Bacon Salad. And did you happen to see my post on fantastic gluten-free beer?